Happy St. Basketball Day! Zags (men and women), NCAAs in Spokane, EWU wins, upsets on the horizon! 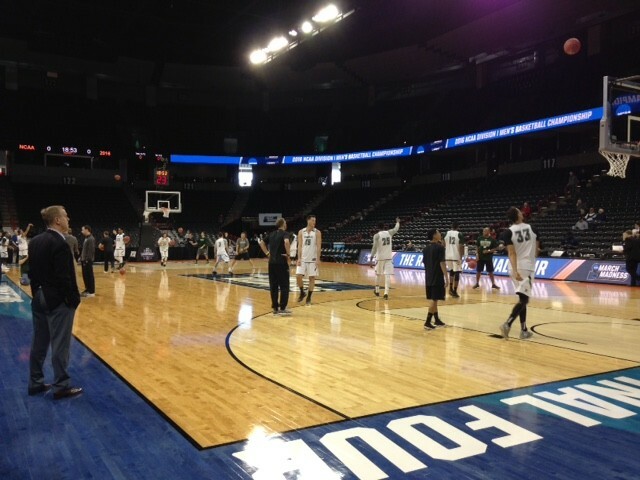 The Spokane Arena is looking good for tomorrow's NCAA tourney games. Merry St. Basketball Day, people of the Inland Northwest, and what a fine day it is. There are two huge Zags games coming this evening. There are NCAA title contenders in our fair city. And, also, people are wearing too much green and drinking much earlier in the day and with much more fervor than pretty much any other day on the calendar. It's truly a joyous occasion. There are already a number of NCAA tournament games in the books, and there are many more contests coming down the pike. You probably already know that because you've been streaming games to your computer, but watching with a very determined look on your face whenever the boss walks by. The biggest upset we're obviously waiting for is tonight's 6:57 pm (or later) tip off between Gonzaga (the 11 seed) and Seton Hall (a 6 seed, and the winner of the Big East Tournament). You've probably read that Seton Hall's guards are going to dominate the day, but remember — although GU's guards have tossed away a couple wins earlier this season, they play some pretty lockdown defense. Also, Seton Hall, like most of the country, doesn't have an answer for Domantas Sabonis or, for that matter, Kyle Wiltjer. That game is televised on TruTV, which is a channel you only go looking for during March Madness. Closer to home and — unfortunately — at pretty much the same time as the Zag men, the Gonzaga women's team has a home game in the NIT against UC Riverside. That game is tipping off at 6 pm and there are still tickets available. Although they didn't make it to the NCAA tourney as they did last year, the Eastern Washington men's team secured their first postseason win in the program's NCAA history last night by knocking off the favored Pepperdine Waves out in Cheney 79-77 in the College Basketball Invitational Tournament. They'll play on Monday night against Nevada down in Reno. Finally, I just got back from the Spokane Arena, which is all spruced up to host NCAA tournament games tomorrow and Sunday. Here's a complete rundown of all the teams here. But if you want to take a look for yourself, you can get into the arena to watch practices until 7 pm tonight, and perhaps give a friendly hello to all the out of towners here for the tournament. May St. Basketball forever bless you.